Here are 25 things we have done as a family whilst on holiday at Sandcastle Cottage. 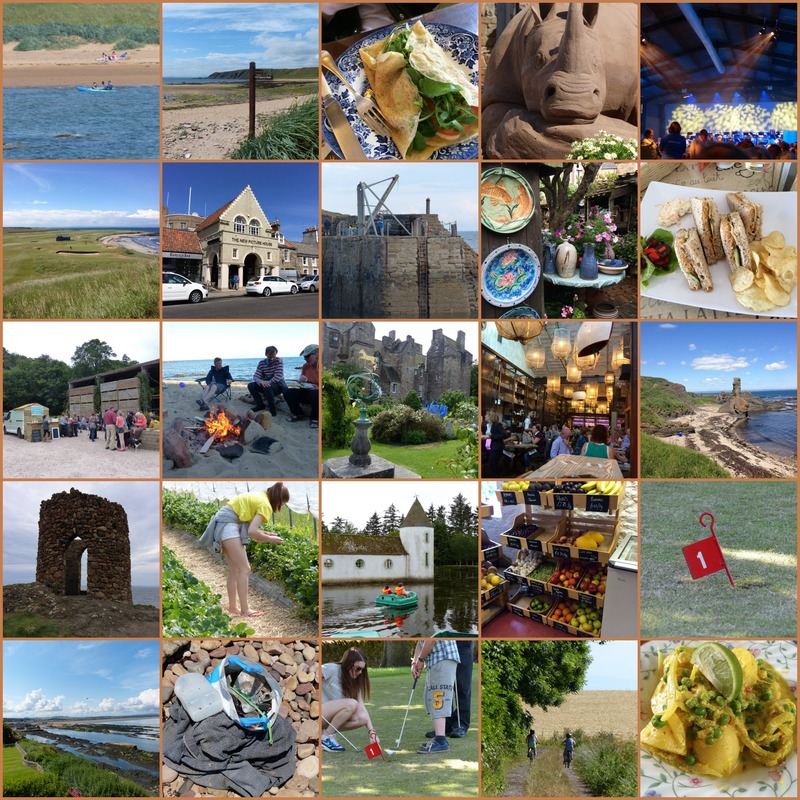 There is definitely something for everyone on a holiday in the East Neuk of Fife and St Andrews. As seasoned holidaymakers in the area, there are of course some glaring omissions but we thought the selection might inspire you if you’re considering a break here. As owners of Sandcastle Cottage, we have had a base in the village of Crail since 1982. It’s a lovely village, and over the years we’ve had a small circle of friends and acquaintances there through neighbours, old friends who’ve lived here for a while, and some of the other holiday home owners we’ve got to know via emails and occasional meet-ups in Crail.The great thing we’re finding about the growth in new technologies (grouped loosely together under the umbrella term ‘social media’) is that we’re getting to know lots more people in Crail by sharing our knowledge of how to be social on-line.Yesterday, at one such meeting, Peter Salkeld, Graham Anderson and I were discussing how to make the most of the tools available on the internet to publicise an event which Graham’s driving forward – next summer’s Crail Food Festival.Peter was remarking that in days gone by, we’d have put up posters round about Crail and the local villages, and maybe we’d have attracted some local people and a few tourists to come to such an event. More recently, we’d have advertised by building a website and using the website address on our poster campaign to allow people to find out more about the details of the festival. But over the last 5 years, new tools have been emerging which should allow us to publicise our event to many more people, which will hopefully lead to the event being a commercial success as well as great fun and a lovely day out in Fife – or the centrepiece of a weekend stay here.We were discussing Twitter and Facebook and how they can be used to help us to make the most of our event.We have a website for the Crail Food Festival, and it’s currently being developed as we contact more potential sponsors and participants who will want to come to Crail to showcase the best of Food and Drink in Fife and Scotland. We also have a Crail Food Festival Facebook page where friends can participate and hear the latest news, and a Crail Food Festival Twitter account where we’ll be building a following by adding friends and helpful Tweets about food in Fife and more details of the events as they become available.Our discussion yesterday centred around the power of these new tools to encourage our friends to visit the website for the event, put the date in their diaries, and most important of all – to come along and support the event.A little Facebook workshop developed as we discussed the difference between having a personal account on Facebook – all three of us: Graham, Peter and Susan have them, but there was a little clarification on how Facebook Pages – such as this one for Crail Food Festival were different from our personal accounts.When it came to the Twitter discussion in our meeting however, we needed to have a concrete example of how Twitter is at the basic level a really helpful tool. Graham plucked an example out of the air. He said: “here’s the thing – I’m going to Dundee this afternoon. What if I were to ask on Twitter where I should go for a coffee?” (As the owner of the Honeypot he’s keen on people asking that type of question :)). I said that the first thing you’d have to do is make sure that you have enough followers who know Dundee well to get a chance of getting an answer – but I’ve got quite a few followers on my @2crail account – I’ll have a go.Here’s what happened:I sent out a Tweet:[blackbirdpie url=”http://twitter.com/2crail/status/7041681375367168″]A little later in the afternoon came the reply from Kim Adamson:[blackbirdpie url=”http://twitter.com/DiscoveryDundee/status/7088387152416768″]Then Kim followed it up with a further reply:[blackbirdpie url=”http://twitter.com/DiscoveryDundee/status/7089029606547456″]And, another suggestion arrived from our friend Finlay – just a bit too late for our coffee-drinking decision (but one to store away for next time):[blackbirdpie url=”http://twitter.com/Caiplie/status/7096468598951936″]As our friends Kim and Finlay had been so helpful, I thanked them for their help:[blackbirdpie url=”http://twitter.com/2crail/status/7099710301020160″]But guess what? Our little chat about coffee had attracted the attention of another Twitterer – our friend Harriet @fictionwitch – who did another thing which good Twitter friends do: she ‘retweeted’ the thank you note – thus giving more exposure to all of the Twitter accounts mentioned.What a super result from our little coffee friends experiment. Do you have an example of how Twitter or Facebook friends have helped you out that you’d like to share? Add a comment below if you do. I had the good fortune to be invited along to a meeting of the Crail Business Network last night in the East Neuk Hotel, Crail. Billed as a social evening and get-together there was an item on the agenda for discussion which I was interested to hear more about and felt it worth making the effort to attend in person.It’s been a busy week one way and another, and I was feeling a little overwhelmed at the number of new people I’d met in the past few days at the Fife Diet AGM and St Andrews and East Neuk Tourism Innovation Events I’d attended, and the number of new ideas which had been circulating in my head from the different discussions I’d been involved in.But there is a common thread to these meetings, and it’s about information: how we receive it, how we process it, how we pass it on, what we do as a result of having found the information. So, when asked to take to the floor and talk about what social media means to me and how it can help us in Crail, I thought about a little story which I’m going to tell you now.Social Media works. Why do I say that? Because, by being active on Twitter (2crail and 2edinburgh) and using the links I found there, I’ve taken bookings this year based purely on ‘conversations’ I’ve had with potential guests who have noticed that I rent holiday homes. Using these methods is not a quick fix for your business, but it is a way of getting people who might never have heard of you before to look at your website and find out more about you.Through talking to various people in Crail, I’ve encouraged (no, not bullied, Graham!) people I’ve spoken with to take tentative steps with social networking – initially through Twitter, and increasingly through Facebook too – and to explore what it has to offer. The Crail Accommodation Network (a co-operation between the accommodation businesses in Crail) gave me the idea that we could be using some of the tools which are freely available to advertise late availability and assist the potential visitors to Crail to find what they are looking for. To this end, I set up a Facebook Page (Crail Last Minute) and encouraged any of the accommodation providers who had a personal Facebook Page to ‘like’ the page, thereby allowing me to grant them administrative status so they could post their own late availability. Every time a post is made to the Facebook page, a ‘tweet’ is created on the VisitCrail Twitter account, so that we can encourage potential visitors to find out more about Crail Accommodation through a variety of means, dependent on what suits them.Giselle is maintaining a full email list of accommodation providers. When any of us has an enquiry from a guest and we can’t satisfy their request (we’re already booked, or their requirements don’t match our offering in some other way), then the members of the network can forward an email to Giselle asking her to circulate the details of the enquiry. But there is now another way. Peter Salkeld has created a super resource in the website AboutCrail.co.uk – there’s a full listing of accommodation businesses and featured listings for those who are contributing to support the site. It’s a great idea to point potential visitors to the AboutCrail.co.uk site at various points in the booking process, but most importantly before they book and at the time when they’re about to come and stay.We have a ‘blog’ now for the Crail Accommodation Network, which needs to be developed and worked upon, but we’ve got the structure now and are actively seeking ideas and contributions for the blog.Within the blog we’ve successfully managed to pull the ‘Twitter feed’ from the VisitCrail Twitter account so that postings show on the front page of the blog, and we’ve also linked the Facebook account Crail.Last.Minute to it. Unfortunately due to the type of blog we’re not seeing the full Facebook postings – just a link to the page. But we’ll work how to present that better (we’d prefer it to look like this).We also discussed briefly the fact that if you use Facebook as a ‘person’ – i.e. you keep in touch with friends and family through Facebook, then you can set up a page for your business on Facebook and I was delighted that in the social part of the meeting three people asked for more information about how to do this.But all this may just seem like ‘double dutch’ to you right now – what on earth am I going on about? So, here’s my little story:I sometimes search on the Internet for things people have been saying about areas of interest to me, and as we have a holiday cottage in Edinburgh too, when people are in Edinburgh I occasionally read what they’ve been writing about their visit. 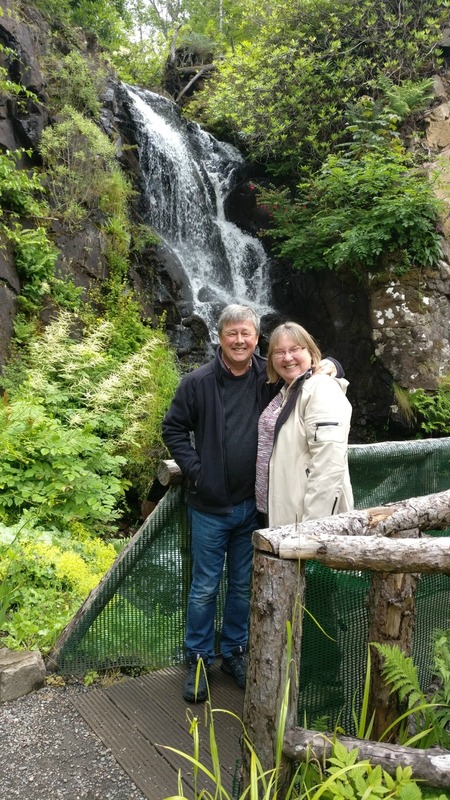 One such person was Lee Ann – a lady from New York – who wrote a blog about her visit to Edinburgh which I pored over one day. And there on her profile was a link which intrigued me: The Fife Diet. I signed up for their newsletter by following the link here back in December 2009. This last weekend, I attended the very first AGM of the Fife Diet which was amazing, delicious and challenging in pretty much equal measures. Which is how I came to be eating Venison Casserole in Burntisland because of a girl from New York. And to illustrate the ‘it just works’ contention: on that very day I also received an enquiry from Lee Ann who has decided to make a further visit to her beloved Scotland … and who booked to stay at our cottage in Edinburgh.Social Media – you don’t have to make a science out of why it works, it just does!And if you want to know some food news about Crail – then watch this space for more information about what might just grow in Crail: but it ain’t coconuts!